Manchester United have placed Jadon Sancho at the top of their list of transfer targets and are willing to break the bank to sign the English teenager. 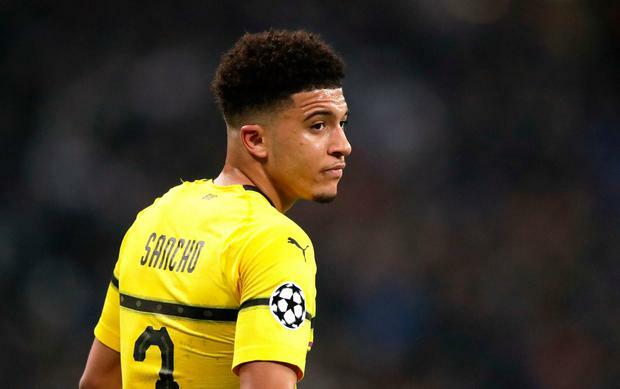 Senior Old Trafford sources believe former Manchester City trainee Sancho could become one of Europe's top players for the next decade and are willing to pay in excess of £60m to bring him to Old Trafford next summer. United's efforts to sign Sancho will alarm City officials who appreciate they made a big mistake when they allowed the London-born youngster to leave for Germany in an £8m in August 2017, with the 18-year-old now established as one of the star players in the German Bundesliga. Interim United boss Ole Gunnar Solskjaer has hinted he is keen to recruit players with pace and trickery in wide positions, with Sancho ticking those boxes as he eyes up a return to England. City are reported to have a sell-on clause in the contract they agreed with Dortmund when they signed Sancho, so any more to United would see the Old Trafford club inadvertently handing over cash to their local rivals. There is also an ongoing Football Association investigation transitions City officials made to acquire Sancho, amid a report claiming an illicit payment of £200,000 to Sancho's agent when the England winger was 14 years old. Now it appears those modest sums may soon be dwarfed by the transfer fee one of Europe's most talked about young players could command this summer, with United set to be at the front of the queue to sign him.